An insufficiency fracture of the pelvis occurs when thin, weakened bone is trying to carry the normal load of the body. Because the bone is thin and weak from osteoporosis, it is prone to fracture. Pelvic insufficiency fractures are among the most common insufficiency fractures that occur in patients with osteoporosis. Most often insufficiency fractures occur as the result of a minor injury such as a fall from standing height. In some circumstances where patients have severe osteoporosis, the fractures can occur without any known injury. The major difference in the signs of a pelvis fracture and a hip fracture is that gentle motion of the leg seldom causes much pain when the pelvis is injured, whereas this causes significant pain after a hip fracture. Tests to diagnose these conditions include routine x-rays, CT scans, and MRIs. While more detail can be obtained from CT scans and MRIs, seldom do these tests change the management of patients with these injuries. Therefore, most often a CT scan is sufficient to make the diagnosis. 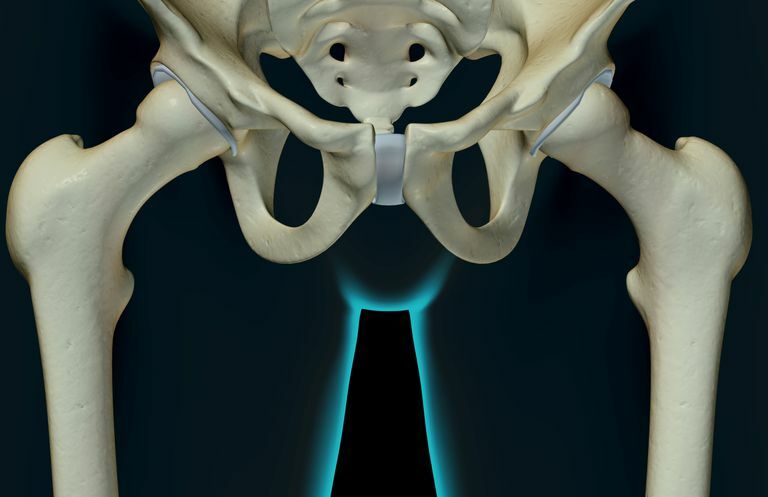 Pubic Ramus Fracture: The most common type of pelvic fracture is an injury to the pubic ramus. The pubic ramus is the ring of bone in the front of the pelvis, and it is typically broken in two places (much like you can't break a pretzel in one place, the pubic ramus ring tends to break on the top and the bottom of the ring). Pain from these fractures is most often felt in the groin, and often the symptoms are similar to a hip fracture. Sacral Fracture: Sacral insufficiency fractures are common injuries, but often the diagnosis is missed. The difficulty is that visualizing the sacral bone, especially in patients with thin bone, is nearly impossible on regular x-rays. Typically these injuries are only seen if a CT scan or MRI is performed. These fractures typically cause buttock pain when walking. Acetabular Fracture: The acetabulum is the socket of the hip joint. This part of the pelvis is important because injuries that extend into the acetabulum can have effects on gait and can change the treatment of the injury. Because the acetabulum is the cartilage covered socket of the hip joint, fractures that involve this area are often treated by not allowing weight (or limiting the amount of weight) on the affected extremity. This weight-bearing restriction can be difficult for elderly patients. Most often patients will recover with a short course of rest, followed by physical therapy and progressive increase in walking. As mentioned, some specific fracture types may require restrictions in weight on the injured extremity, but most commonly patients are allowed to place as much weight as they can tolerate on the extremity. Patients may require inpatient hospitalization or nursing care to assist with their daily activities. The focus of further treatment should be on the identifying the cause of the fracture. Treatment of osteoporosis is difficult but should be initiated in an effort to prevent other insufficiency fractures. While treatment of these injuries is frustrating and inconvenient, it is not as invasive as treatment of a hip fracture (which almost always requires surgery), and therefore every effort should be made to prevent further injuries.